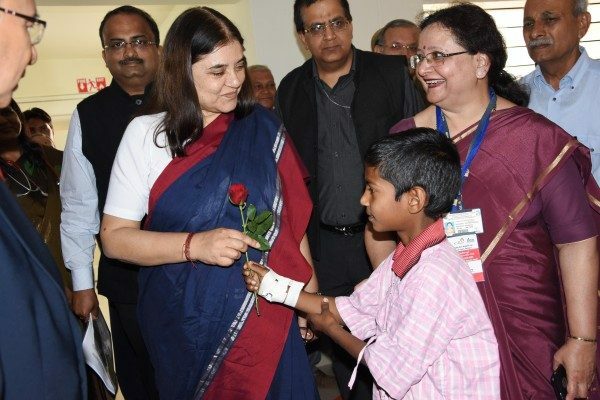 The present Anganwadi system needs major revamping and the Anganwadis must be restricted to pre-school, play, education and shouldn’t be used for serving food opined Smt.Maneka Gandhi, Minister for Women & Child Welfare, Govt. India. She was speaking after inaugurating the Pediatric Intensive Care Unit, Human Milk Bank, ‘Amrutha’ and Pradhanmantri Janaushadhi Kendra at KLES Dr. Prabhakar Kore Hospital. She stressed that serving food through Anganwadi has not improved the Nutritional status of the children. The food being served to children at Anganwadis is not palatable and majority of the children either don’t eat the food or waste the food said Smt. Gandhi. She shared success story of Uttarkhand state wherein 30 nutritional packets per month are sent to children homes which can be made tasty and palatable by mothers and children eat and enjoy it. It has also remarkably brought down the corrupt practices of food being stolen by middlemen. The policy of sending nutritional packets to homes through Aadhar linking is awaiting approval of NITI Ayog, soon it will be implemented said the minister. Aadhar linking of Anganwadi children has reduced the bogus presence of 3 lakh children in Assam & 11 lakh children in Maharastra. She batted for traditional food and millets to be given in abundance to children. Diet and Nutrition should be major part of curriculum in Medical Colleges and every patients must get education on nutrition said Smt. Gandhi. She also called on the people to be aware of milk and milk products before being consumed as it may contain harmful chemicals. The Government of India is promoting Institutional deliveries to reduce infant and maternal mortality rate. She congratulated Dr. Prabhakar Kore and management of KLE Society for establishing State-of-the-art Hospital. Dr. Shiv Prasad Goudar, researcher of KLE Academy of Higher Education presented impressive work done in the field of Women & Child Development. Previous articleAre those Cold Storage units or unauthorized abattoirs?